I'm actually kinda shocked at just how many of my favorite polishes are drugstore polishes. Of all the well-marketed and hugely hyped higher-end polishes out there, I find it quite hilarious that I usually prefer the cheapo no-name 99 cent bin stuff. This is Massini Slamming Red. This picture just doesn't capture how truly awesome this polish is. If you look at the bottle, you'll see a whole lot of holographic effect happening- that's what's happening on your nails when you wear this. I tried to blur this picture a little to show some of that amazing holo glitter, but I just haven't been able to capture it. The name of the polish is Slamming Red, but it's not really a true red... more of a deep magenta? Dark pink? And it's made of lots and lots of glitter in a lightly tinted base. Now, the thing about this polish is that it's chunky as hell. The texture is thick and paste like when applying (though thinner does help) and it's super bumpy scratchy when it dries. However, the polish itself is just so incredibly amazing that I don't care about the formula or scratchiness at all. Even if it was twice as thick and lumpy I would still love it. Sure, it needs an extra coat or two of topcoat, but that is a small price to pay for awesomeness. You may be familiar with Massini if you live in the midwest. It's Meijer's "house brand" of nail polish. You may also find a lot of the names and colors to be very familiar. Massini is a private label by Forsythe (aka Color Club!) so you'll see a lot of Color Club shades in Massini bottles. Which is great if you want to see Color Club's latest collections in person before you buy. They don't always have all the colors and they do have a lot of shades unique to Massini, like Slamming Red and Purple Medallion and those two wacky glitters from Fall that have no names. Massini also has another glitter like this called Purple Medallion, which I've also never been able to capture on camera... But I'm going to keep trying! So... yeah... I love this polish. A lot. And if it doesn't look amazing enough on its own, I Konad'ed over it once with black and it looked super cool. The bright colored holo peeking through the stark black lines... So beautiful. That is gorgeous and Purple Medallion is on my top 20 polish colors! Nice to be in the Midwest. If I couldn't get to a Meijer I would be pretty upset! Looks lovely! I really am happy that there's a Meijer right down the street from me :) Purple Medallion is my favorite, but they do have some unique shades (and a lot of CC dupes!. Wow, that is quite unique! I just love how it sparkles! Why can't other polish brands give us colors like this?!? This one is really outstanding. I wish it would be available in Europe. You are so lucky. In the UK we have a mere fraction of the polishes available to you. The pictures remind me of OPI DS Extravagance. How would you say the two compare? So pretty! I can't imagine a 99-cent polish can look that awesome! In Finland, the cheapest nail polishes cost at least 5 dollars and they also look cheap. I love this polish and Purple Medallion...so glittery and gorgeous! Since I am from Ontario, Canada and have no way of buying these two Massini polishes, would someone be willing to send them to me (I'd pay you of course) or exchange with me? I can get most polishes, just not those that are exclusive to the US. I would be indebted to you forever!! That is a beautiful color! 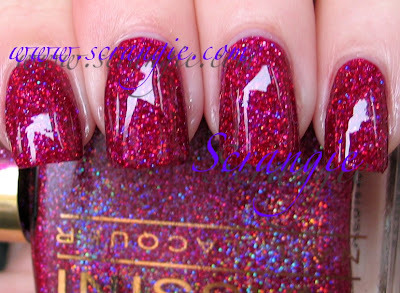 I love the glitter, it helps give the polish a depth that isn't in most glitters. I think I like it better than the China Glaze glitters. It's like ChG Atlantis...only Pink! I am digging this color. Sadly, I am on the west coast and the only Meijer even close is in Oregon I think. :( I haz friends tho! ooh this looks so lovely! I esp like the fact that it looks almost like a jelly but isn't quite a jelly...And the shimmer and the glitter...AWESOME! Wow, that is FABULOUS! I will have to look out for this store if I am ever in the Midwest. Wow, what a stunning polish - and you can't beat the price!!! I have this shade and it is one of my favorites! It is so complex, and the glitter is just gorgeous!! You did a really good job of photographing it - mine never quite come out right. Thanks!! Nice! Have you tried throwing a Matte topcoat on that baby to see how it'd look? I'm going to have to hit up my Meijer and see what goodies I can find! really pretty, I wish we had a Meijer around here. OMG I want this!!! Only st Meijer?? I too love this shade - I'm actually wearing it right now! It's gorgeous...the glitter gives the polish such depth, and it is so difficult to photograph! Thanks for posting...it looks beautiful on your hand! Yay! I finally found a Meijer near (well, not quite near...) me, and got this polish! (along with Purple Medallion and a few others...) While I was looking through the other Massini's, I noticed something very interesting- many of the colors, including the names, are exactly the same as Color Club's. Is Massini made by Color Club? Plus, Meijer's ROCKS. Thanks for the heads up!